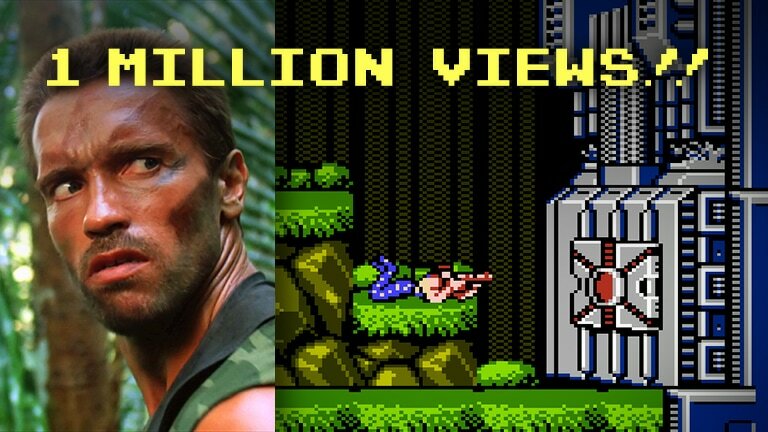 'Predator' / 'Contra' mashup hits ONE MILLION views!! Our popular mashup of Arnold Schwarzenegger's movie ’Predator' (1987) with 80s CONTRA (Nintendo) video game sound effects has now surpassed ONE MILLION views on Facebook! Haven't seen it yet? Watch it here! ​Up up down down left right left right BE ARNOLD select start! The Predator/Contra mashup now joins two other RetroSFX mashups that have also crossed the one million mark---'Rocky IV' (1985) with 'Mike Tyson's Punch-out!!' (1987) sounds, and Michael Phelps with 'Super Mario Bros.' (1985) swimming sounds. Level up!! And as always... thanks for sharing! This milestone is because of YOU! RetroSFX makes hilarious viral mashup videos of classic movies and sports highlights with retro video game sounds.